Apple's iPhone sold more than 217 million devices in 2018. First introduced to the market in 2007 it has since become a revolutionary device that has changed the landscape of the mobile industry. 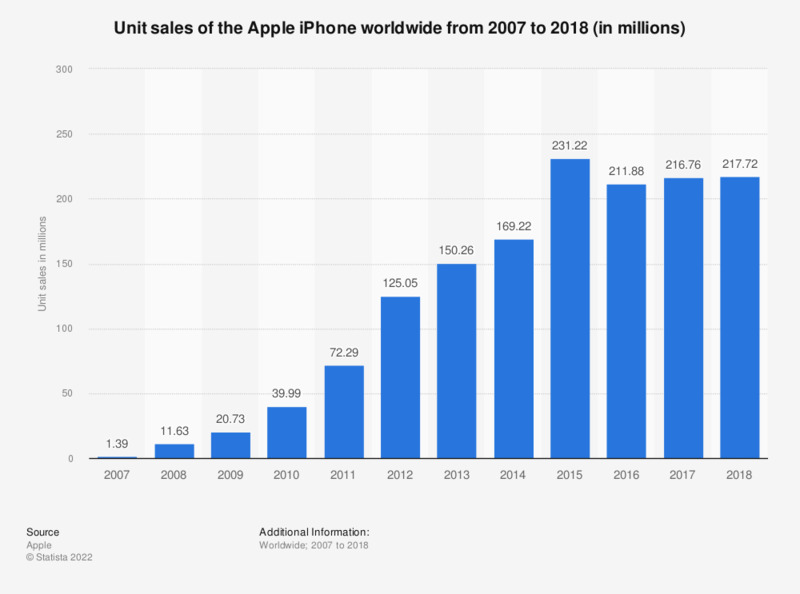 Twelve years after its initial release, altogether about 1.5 billion iPhones have been shipped worldwide, making it one of the most used smartphones in the world. Founded in 1976 by Steve Jobs, Steve Wozniak, and Ronald Wayne in California, Apple initially focused on the development of computers and brought Macintosh, the first personal computer, to the market. In 2007, CEO Jobs changed the name from Apple Computer, Inc. to Apple Inc. while announcing the first-generation iPhone, shifting the company’s focus from computers to consumer electronics. iPhone’s great success contributes to Apple’s booming revenue and helped to make the company one of the world’s most valuable brands. In recent years, iPhone sales have consistently made up for about 60 percent of Apple’s total revenue.